The old Elna is packed up for now. She will have to live in the sewing annex with my older Kenmore. I know, I know, I was singing her praises a mere 3 months ago. 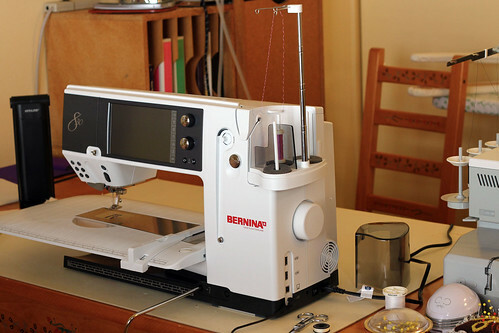 The new Bernina 830 is an amazing machine. I will be calling her Belle, because Rick is currently working on a stereo [like 3D for drawn animation] version of “Beauty and the Beast”. The machine is so big and well, pricey, that I think Rick will be calling her Beast. I spent all morning playing with all the wonderful things Belle can do. She sewed everything perfectly using my cheap thread. I am going to finish up a couple of projects, then hopefully get into the embroidery part next month. I also received a free software program with the machine that does cut-work. Belle will be able to cut holes and then embroider around them. I will have lots to share eventually, depending on how my old brain handles all the learning curves. This entry was posted on Friday, October 30th, 2009 at 3:00 am and is filed under Bernina 830 and Sewing. Tagged: Sewing. You can feed this entry. You can leave a response, or trackback from your own site. I saw on your flickr page that you were playing around with stitch combos! Sweet! Each and every stitch looks perfect! Congratulations! I can’t wait to see what you do with her! She is a beautiful “beast” though – guys probably look at things just a bit differently then we do – they find beauty in tractors, the latest drill or saw, pressure washer, etc. Your stitches are amazing and the sky is the limit…have fun with the new Belle.